Christ is referred to as having three offices; Prophet, Priest and King. In what sense is He a priest? As a priest, He represents men to God, and God to men. He offers sacrifices. He serves God. He mediates between God and man in their covenant. Christ was, humanly speaking, from the tribe of Judah. It was the Levites who were the priestly line. In fact, any time a king tried to take on the priestly role, they were rebuked and removed. (i.e. Saul and Uzziah) According to the law of Moses, a king could not be a priest and a priest could not be a king. How then could Jesus be a priest and a king? In Genesis 14, we’re introduced to a person named Melchizedek, who is referred to as a priest of God Most High and king of Salem (Jerusalem/Shalom/Peace). Melch means king and zedek means righteousness. He meets Abraham as he is returning from a military victory. 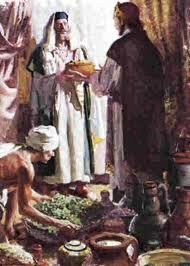 Abraham, the patriarch recognizes Melchizedek as his superior, and gives him a tenth of his spoils. Some comment on the tenth as a tithe even before the law was given, which may or may not be significant. He also gave him bread and wine, which may foreshadow the Lord’s supper, and Christ’s sacrifice of His body and blood, although they aren’t mentioned in that context in the New Testament. They were common staples. He was basically bringing nourishment to the troops. The verse seems to be plopped into the narrative in an odd place. But perhaps it was to remind Abraham that it was God who gave him the victory, since right after that, the King of Sodom offered him the spoils of war, which he refused. Melchizedek seems to come from nowhere. In a book known for long lists of genealogies, the lack of information about him is significant. That’s one reason some believe He was a theophany, a pre-incarnate appearance of Christ, which we see in several other places in the Old Testament. However, there’s no indication that Abraham recognized him as such, and all treatments of this section in other parts of Scripture don’t approach it that way. Psalm 110 is another place where Melchizedek is mentioned. This psalm is the most quoted verse in the New Testament. This verse, like the one in Genesis 14, also seems to have been dropped into the psalm. This psalm is widely accepted as being a Messianic psalm, meaning it was prophesying about the coming Messiah. It describes an enthroned priest-king setting out in conquest of the world. David is implying that the Levitical priesthood is not good enough; it must be eclipsed. The law and the priesthood are tied together, so that if you take away one, then the other must go too. D. A. Carson says sequence matters. In Genesis 14 Abraham encounters Melchizedek, a priest-king before the law is given. Half a millennium later, the law states that the king and priest cannot be the same person. David then says there will be a priest-king, making the law in principle obsolete. Then Hebrews says we have a priest-king from the tribe of Judah, making the law and old covenant obsolete. It’s only when we get to the New Testament that some light is shed on exactly how Christ is like Melchizedek. Hebrews 7:3 says that Melchizedek was “without father, without mother, without beginning of days or end of life, but made like the Son of God, remains a priest forever”. This makes it sound either like he is a theophany of the eternal Son of God, or merely a reference to his appearance out of obscurity. He shows up in one scene in Scripture and then disappears just as quickly. We know nothing else about him, unlike all other important persons throughout Scripture. So, how is Christ like Melchizedek? Further, without beginning or end of days in relation to Melchizedek means we don’t know anything about his lifespan. There is no mention of how long Melchizedek lived, as you also see in the genealogical lists. To the Jew, and then for our sake, it was important to know which family line someone descended from. It was how we would recognize the Messiah, who would be from the family line of Judah, and then a descendant of David. In relation to Christ it refers to His eternal Sonship. As God, He had no beginning and He will have no end. He is the eternal God, the Ancient of Days, the Alpha and Omega, the Beginning and the End. He lived before the stable in Bethlehem and will exist forever. As such, His priesthood is far superior to the Levitical priesthood. Those priests could only continue for a while, because death eventually overtook them. But Christ, who is the eternal Son can be a Priest forever, because He will never die. He can continue to be the Mediator between God and man, making intercession for us because of the sacrifice of Himself, making atonement for us with His blood. Questions-Do you realize you need a priest? Not an earthly one, but a perfect One? This One sacrificed Himself so that His blood could cover your sin. He also mediates between you and God the Father. (see the blogpost on Christ as the Mediator in Job). Response-Thank God for being a far superior priest to the types and shadows of the past. 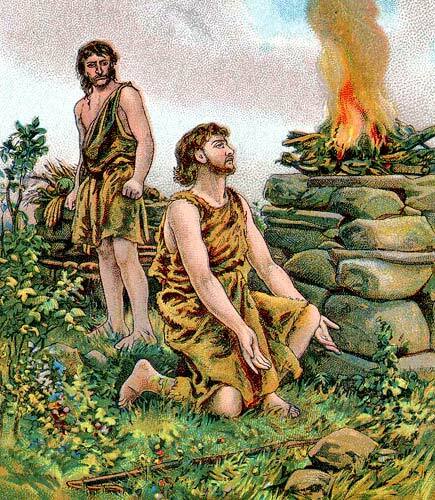 Cain complains that his punishment is greater than he can bear. He is not sorry for his sin, only sorry he got caught. He fears a violent death, like his brother. Even so, God again shows mercy to him by delaying the sentence of death already over his head because of the disobedience of his parents. He is also a shadow because of the contrast between the intent of the blood of Abel vs. the blood of Christ. Abel’s blood cries for vengeance, but Christ’s blood cries for forgiveness. Questions-Do you feel envious of someone else’s ministry? Why do you think you have that attitude? Response-Thank God for the sufficiency of His sacrifice that allows you to enter His presence with boldness. One of the most beautiful ways Jesus is portrayed in the book of Genesis is as the sacrificed son of promise, presented to us in the narrative of Genesis chapter 22. Abraham and Sarah had waited a long time for God to fulfill His promise to them. Deciding maybe He meant for them to figure it out, they took matters into their own hands. Sarah gave her servant, Hagar to Abraham; Ishmael was the result. But the son of the bondwoman was not the child of promise, Isaac was. Because of Isaac, Sarah and Abraham experienced joy in their old age. God had not forgotten His promise. He never does. It may just seem that way from our perspective. Fast forward. Isaac is a young man. He doesn’t know that God has spoken to his father in the night, and he’s about to have a day he’ll never forget. Notice though, how God shows He understands the magnitude of the sacrifice He is asking Abraham to make. He knows, because one day, He’ll do it, too, but no one will stay His hand. Read verse three. Notice that? “So Abraham rose early in the morning…” I know it’s stating the obvious, but in order to wake up you have to have gone to sleep. How could he have slept? More than that, he woke up early, eager to obey. I would’ve pressed the snooze button a few times at least. Notice also, that there’s no record of his telling Sarah what God had told him. With good reason. That would not end well. This is her baby, regardless of his age. And hasn’t He done that in history? All the repeated sacrifices of animals throughout the centuries only pointed forward to the perfect Sacrifice, which would put an end to all other sacrifices; the One provided by God, Himself. “The Lamb of God, who takes away the sin of the world!” John 1:29 God took His Son, His Only Son Whom He loved, and sacrificed Him. 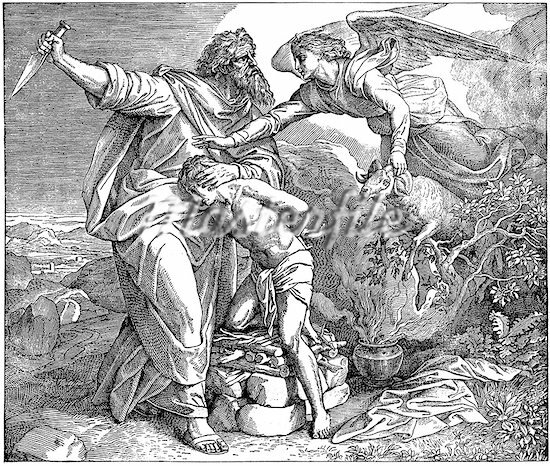 Did Isaac protest or struggle as Abraham bound him on the altar? There’s no record of it in Scripture so I’d conclude no. There was no, “Father, what are you doing?” or “How could you do this?” or “Please, Father, no.” Just submission to his father’s will, even though he knows it means an excruciating death at the will of his own Father. Seemingly out of nowhere, after God/the Angel of the LORD tells him not to lay a hand on the boy, a ram appears. It’s significant that Scripture records the detail that it was caught in a thicket by its horns. This would mean its body would be unblemished, and so would be a suitable sacrifice. In this narrative we see Christ as the sacrificed son, but we also see him as the substitute for the one under sentence of death. A thicket is a mass of thorns, and represents sin, and horns are a symbol of strength. So we see Christ pictured as held fast by sin, for us. Then the ram is offered up, “instead of his son.” Gen. 22:13 Here we see a beautiful picture of substitutionary atonement. Abraham’s hand was held back by God. He was really going to do what God commanded. God knew his heart and his motives. He also saw his faith that in spite of this, God would keep his promise. As they were approaching the mountain, Abraham left the servants to wait, promising that, “the lad and I will go yonder and worship, and we will come back to you.” Gen. 22:5 Notice he saw what he was about to do as an act of worship. He didn’t say they would both return because he was lying to his servants or because he didn’t intend on following through on God’s command. In the book of Hebrews we’re told that Abraham believed God was able to raise him from the dead. “By faith Abraham, when he was tested, offered up Isaac, and he who had received the promises offered up his only begotten son, of whom it was said, ‘In Isaac your seed shall be called,’ concluding that God was able to raise him up, even from the dead, from which he also received him in a figurative sense.” Heb. 11:17-19 It was impossible for God to lie. Abraham was so sure of God’s character and God’s word. After all, He had already given Isaac to him, as He’d promised. “And Abraham believed God, and it was counted to him as righteousness.” Gen. 15:6 Abraham would do as God commanded, even though it seemed to go contrary to His promise that through Isaac the world would be blessed. After the Angel of the LORD stayed his hand, He again reiterated the promise to multiply his descendants as the stars of the heaven and as the sand of the seashore.” He also tied the blessing into Abraham’s obedience. “In your seed all the nations of the earth shall be blessed because you have obeyed My voice.” Gen. 22:18 But many years later, God the Father didn’t hold back His hand. He slew His own Son. Jesus felt the rejection of His Father as the worst part of the crucifixion. Prayer– “There are times when what we read in Scripture is so overpowering to our souls. This account is one of them for me. I can’t imagine Abraham’s thoughts. I cannot fathom the kind of faith it takes to rise up early to obey. I don’t know if I would have that kind of faith to trust that if I killed my son, You would raise him up again. At the same time, I see beyond this narrative to the greater story behind it. The story of what my salvation cost You. It cost You Your Son. You did not hold back your knife of judgment, but buried it in the body of Your Son on the Cross. I stand amazed at Your willingness to part with Him when He came to earth, I stand even more amazed at Your willingness to allow Him to be killed by His creatures, and His willingness to be sacrificed for our sin. Thank You for so great a salvation.” Amen. Questions– Are you holding anything or anyone more dear than God? Do you need to lay your “Isaac” whatever it may be, down on the altar and let God demand what He may? A scary thought, to be sure. But consider what God has done for you in giving His own Son. Now reconsider if you need to cling to it. Response-Spend time alone with God and consider all the things you were sure were God’s plan for your life. Perhaps they are, but ask yourself if you’d be willing to let them go if God were to simply ask you.